This page covers Digital blood pressure monitor basics.It mentions Digital blood pressure monitor application note and Digital blood pressure monitor manufacturers or Vendors. The digital blood pressure monitor is basically a device which is used to measure blood pressure of human being. This device usually comes with LCD display along with easy to read inprogress results. It measures diastolic and systolic blood pressure. It measures pulse rates simultaneouly. It also detects and alerts the users whenever there is irregular heartbeat. At rest healthy young person will have systolic arterial pressure of about 110 mmHg and diastolic arterial pressure of about 70 mmHg. Blood flow is the measure of blood volume which flows through any tissue in certain period of time. The blood flow is measured in ml/min. This flow helps in transportation of oxygen as well as nutrients in the blood. This blood flow depends on blood pressure. It flows from high pressure area towards low pressure area. More is the pressure difference, higher is the blood flow. Blood will be pumped from left ventricle of heart out towards aorta. Here it reaches its higher pressure levels. Blood pressure falls when blood moves away from the left ventricle until it reaches 0mm Hg at right atrium of the heart. Figure-1 depicts variation of blood pressure across different blood vessels. 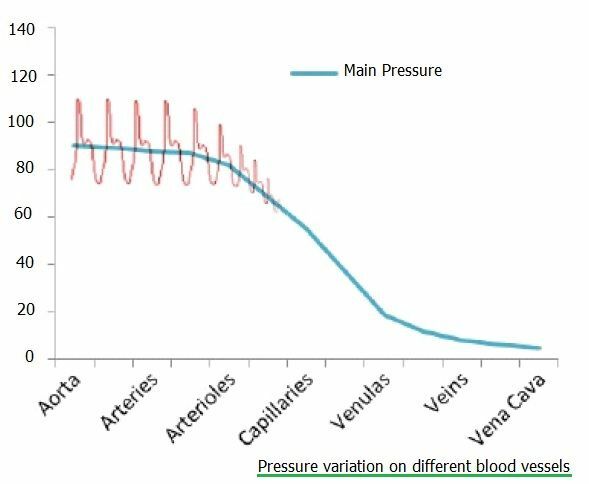 Let us understand how blood pressure monitoring works with the curve depicted in the figure-2. This pressure monitoring is as per oscillometric method. This method works based on pressure pulsations recorded during the measurements. An occlusive cuff is fixed on left arm. This is interfaced with air pump and pressure sensor. • Step-1:Cuff is inflated until a pressure greater than typical systolic value is reached. • Step-2 Then the cuff is slowly deflated. When cuff will deflate and at the same time when systolic pressure value will be reached then pulsations will start to appear. These pulsations will represent pressure changes. This depends on heart ventricle contraction. This is used in order to calculate beat rate of the heart. Pulsations grow in amplitude until MAP (mean arterial pressure) value is reached, then decrease until they disappear. Systolic and diastolic values are calculated using algorithms. The values will vary with different medical equipment manufacturers. Freescale has developed affordable digital blood pressure monitor using its state of the arts microcontroller Units Kinetis K53 and other electronic devices such as ADC/DAC, OpAmps, TRIAMPS etc. Freescale Blood Pressure Monitor device calculates the systolic and diastolic pressure. For this calculation it is assumed that systolic pressure is approx. 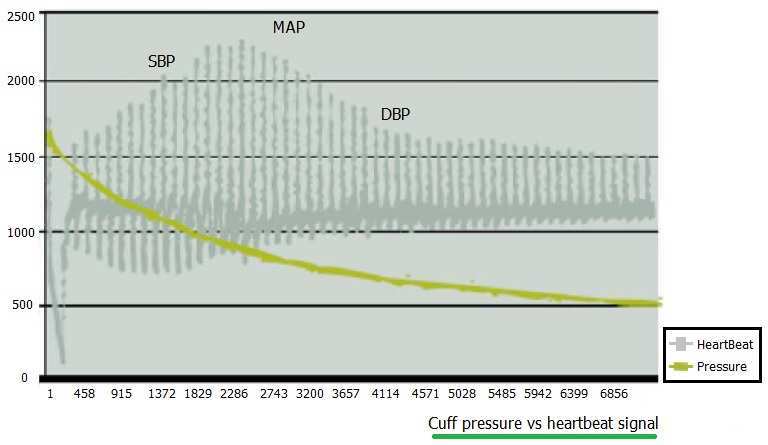 equal to the pressure measurement recorded in the cuff when a pulse with 70% of the amplitude of the MAP pulse appears while the cuff pressure is above the MAP value. Diastolic pressure is approximately equal to the cuff pressure value registered when a pulse with 50% of the MAP pulse amplitude appears while the cuff pressure is under the MAP value. For more information visit www.freescale.com.